Jim pulled out the box with the powdered sugar, and made a mess today. But then, what's new. I asked Tom to clean it up. You can see his orange shirt and "guns" on the left. Well, Jimmy decided that he was going to take matter into his own hands. He got down on all fours, and started to lick it up. 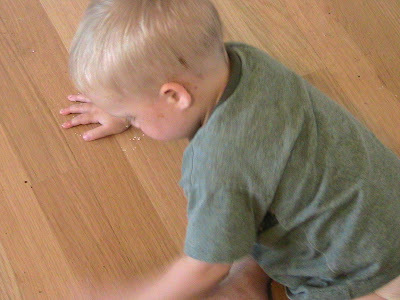 Joe couldn't stand by idly and let his little brother have all the fun, so he promptly got down on all fours, and started to lick it up. I had the picture lined up just perfect, of Jimmy licking the wood, and Eme stepped right in front of it. This is a little bit after. Sorry, it was almost the perfect picture! 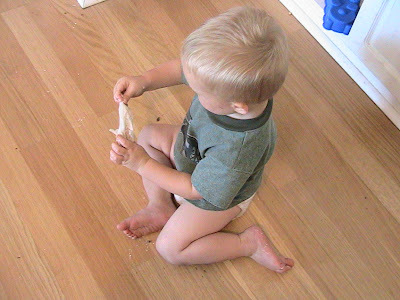 These are of him finishing off Tom's job, with the sticky paper towel. I think he was wiping and sucking it off. Silly boy. Haha, kids are always making a mess, that's why man created paper towels in the first place.